As the NHL champions battle it out for the Stanley Cup, Intertops Casino is continuing its $100,000 spring bonuses program and Intertops Champions Leaderboard contest. At the end of May, three players who have reached the top level of the contest leaderboard will each win a $1000 cash prize and a further nine will receive a grand prize casino bonus of up to $500. In the meantime, every week hundreds of players will get bonuses up to $250. 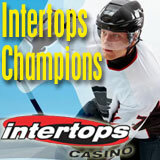 The Intertops Champions contest will award a total of $100,000 in cash prizes and bonuses. With a progressive jackpot pool of more than $5 Million, Intertops Casino offers some of the hottest online slot machines around. Several slot machine jackpots -- Jackpot Pinatas, Aztec's Millions and Midlife Crisis/Shopping Spree -- are well over a million dollars. Intertops welcomes players from around the world and is famous for its quick, hassle-free deposits and withdrawals. It’s one of the world’s first online casinos and has earned its reputation for excellence in customer service over and over again. Intertops offers an incredible selection of instant-play and download casino games including three and five reel slots, multi-hand video poker, and traditional casino favorites like Blackjack and Roulette. If you've played at Intertops Casino, please comment below to let other players know about your experience there. Use the links at the top right of this page to Share this story with your Facebook Friends or Tweet it on Twitter.